I've seen this statistic reported on several sites (for example, Those Who Don't Build Must Burn and Want To Do Meaningful Work? Keep Reading. Literally), along with a list of other startling numbers. 33% of high school graduates never read another book for the rest of their lives. 80% of U.S. families did not buy or read a book last year. A lot has changed since 2003 (Harry Potter, Hunger Games, ebooks). Have there been any more recent surveys that show a decline in the statistics reported by the Jenkins Group? 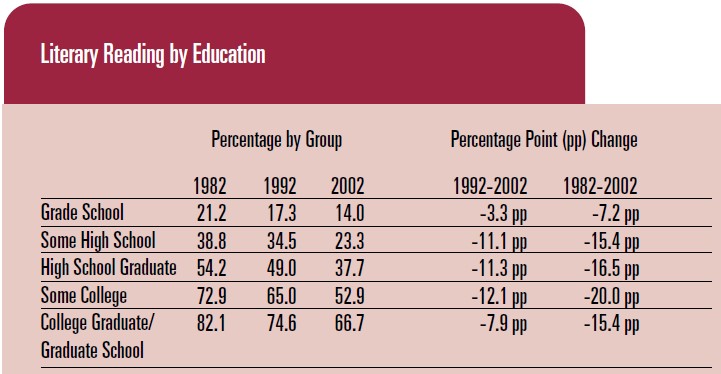 Brief summary for those who don't want to read the whole thing - reading in the United States is in decline, but not to the extent suggested by the Jenkins Group survey. I'll take each point from the question in turn and attempt to answer it. I wasn't able to find the Jenkins Group survey referred to, however I found two useful reports by National Endowment for the Arts - To Read or Not To Read and Reading At Risk and I'll mostly be using these. Note that respondents were asked if they had read any novels, short stories, plays, or poetry in their leisure time (not for work or school) during the previous 12 months. So this would appear to be a narrower question than that asked by the Jenkins Group survey. It's also worth noting that the more education you have received the more likely you are to read literature, which is the opposite of what was claimed by the Jenkins Group survey. This graph from Reading At Risk shows that 56.6% of individuals stated that they had read a book in the previous 12 months. If 56.6% of individuals have read a book, then I don't see how only 20% of households could have read a book. Traditional bookstores accounted for less than half of the book market last year ... The majority of books were sold by a variety of other retailers including Amazon, Price Clubs, supermarkets and convenience stores. 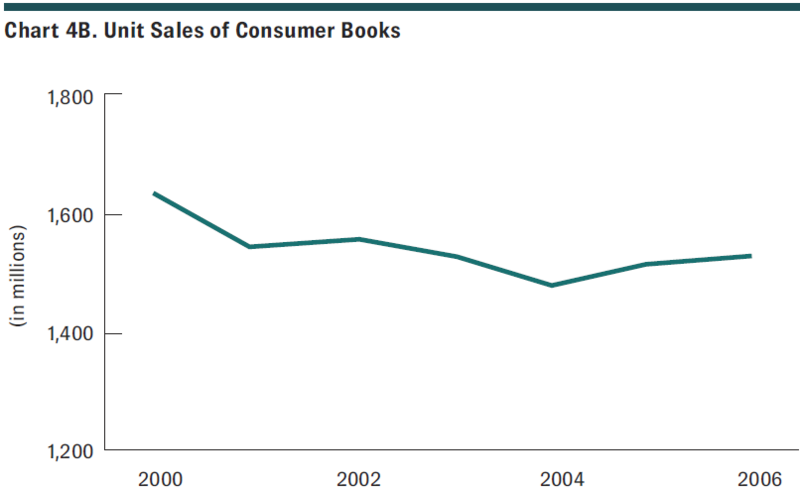 It's worth noting that book sales have been relatively flat (source - To Read or Not To Read), and I'm not convinced that it matters where a book was bought. I was unable to find any useful data on this point. The Jenkins Group reading statistics have been apparently disowned by the group. Some of them were based on a variety of legitimate sources, including the Book Industry Study Group and U.S. News & World Reports per libereading, but things like calculating the percentage of high school graduates to never read another book for the rest of their lives is obviously only going to be a vague guess at best -- and one that isn't supported by any known research. Some of the latest statistics for reading in children by other surveys are provided below. Per Annika Bergström in 2014, research shows that there is a decline in book reading noticed within the last few decades in Europe and in the US. 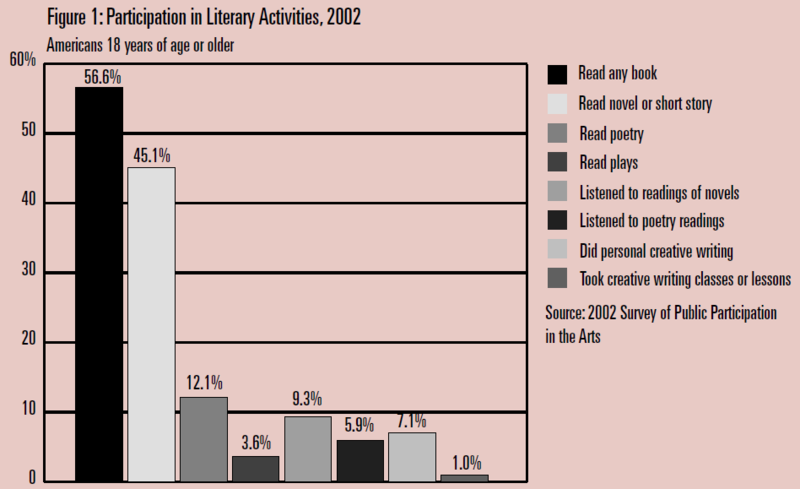 According to the Survey of Public Participation in the Arts (SPPA) in 2009, the percentage of Americans who read at least one book of fiction or nonfiction in the previous 12 months (outside of work or school requirements) decreased from the early 1990s to 2008, the time span for which data of this kind are available. Whereas in 1992 61% of Americans reported having read a book for pleasure during the previous year, in 2008 54% reported having done so. The SPPA findings make clear that age matters when it comes to reading rates. The greatest decline in reading rates, 10 percentage points (approximately a 15% drop), occurred among adults ages 18–54. For each of the groups of older Americans examined here, the decline was not statistically significant. 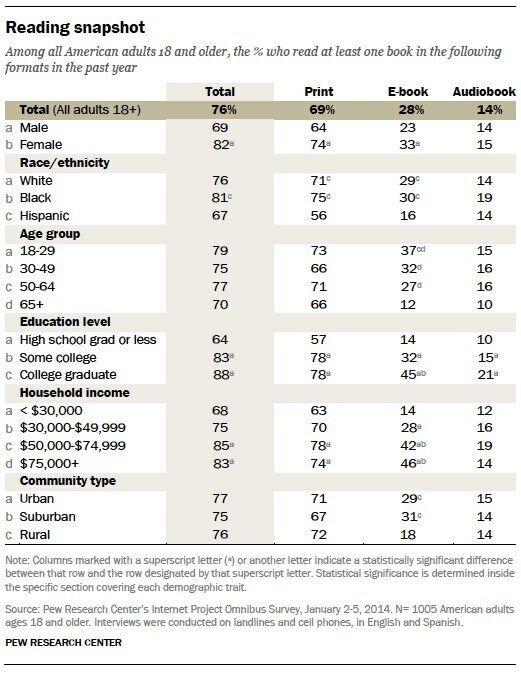 Taken as a whole, older Americans (55+) were just as likely to be book readers in 2008 as they were in 1992. Book reading in 2008 was more common in the United States than in such countries as Italy and Greece, but less so than in the Scandinavian nations of Finland and Sweden (the top-ranked country). According to the survey carried out by TNS Opinion & Social network in the then 27 Member States of the European Union and in Croatia between 26 April and 14 May 2013, “reading a book” is strongly predicated by the level of education of the respondent (managers have the highest book-reading frequency). Reading a book was almost as popular, 68% having read a book at least once in the last year. There has also been a decline in reading books, with fewer respondents saying they had read at least one book in the last 12 months (down from 71% to 68%). In all EU countries (with the exception of Portugal) lack of time is given as the main reason for not reading more books in the last year. Education appears to be the strongest predictor of reading, with 51% of respondents who had studied beyond the age of 19 and 48% of those still studying reading 5 or more books in a year. In some ways it is a little surprising that respondents still studying are not reading more; perhaps some of them spend a lot of time reading parts of books/textbooks, and they might not describe this as “reading a book” in the context of cultural practices. Predictably, managers and students were the occupational categories with the highest book-reading frequency; 59% of managers and 48% of students had read more than 5 books a year. Lack of time is the most frequent reason given for not reading books more often by 25- 39 year-olds (56%). Respondents who left education at 15 or before give lack of interest as the main reason for not reading more (44%), while just 25% mention lack of time. Strikingly, at least 45% of all those leaving education after the age of 15 years of age say that lack of time is the most important reason for not reading more. It appears that those spending the most time in education believe that reading is a very important cultural activity and that lack of interest is a less acceptable reason for not reading than lack of time. Per estimates for September through May, 2003–07, the percentage of high school students in USA spending time for reading is low when compared to percentage of high school students spending time for other activities. Research shows that children who read frequently develop stronger reading skills. Per Christina Clark in 2015, levels of daily reading also continue to increase for children in UK. This 'reading snapshot' indicates that only 64% of high school graduates read at least one book in the past year, which means 36% of high school graduates didn't read at least one book in the past year. Another resource on reading statistics is the book Reading Matters: What the Research Reveals about Reading, Libraries, and Community by Catherine Ross, Lynne McKechnie, and Paulette Rothbauer. This book has data from a variety of sources grouped by age of reader. One idea I took from this book is when evaluating reading studies, you need to understand how they define reading and reading material. In our modern society, reading might not be declining. It may be that people are not reading as many books. Another important question is why are people not reading book and does this lack make our society dumb or are we evolving? Not the answer you're looking for? Browse other questions tagged united-states education books . Are the claims about reading after graduation in this photo accurate? Is the Bible the most read book? Does the average software developer not own (or has never read) a book on software development? Does the average American eat 7,000 animals during their lives? Does attending a highly ranked high school in the US increase one's future success?